The second photograph shows the view from Conrad’s grave to Wilhelm Kuhfuss’ grave. 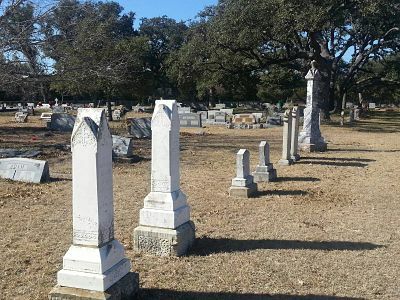 They are on border of the original part of the cemetery. (Boerne, Kendall County, Texas). Carl Wilhelm Kuhfuss marker; personally read 2014. 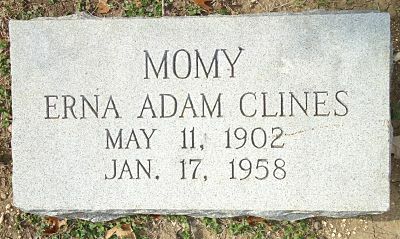 Adam Vogt was one of forty young men who founded the settlement of Bettina in the Fisher Miller Grant under the direction of the Society for the Protection of German Immigrants in Texas. Most were university students from Giessen, Heidelberg and from an industrial school in Darmstadt. Gustav Schleicher and Dr. Ferdinand von Herff organized the group of men in 1847 and called them “Die Vierziger” or “The Forty”. This settlement was abandoned by the end of summer in 1848. In 1849 five members of “The Forty”, Adam Vogt, Philip Zoeller, Wilhelm Friedrich, Leopold Schulz, and Christian Flach organized a farm they named Tusculum. This lasted about two years. 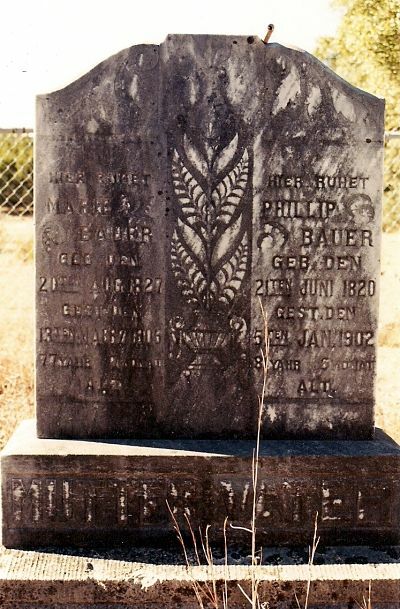 Not far from the farm, Gustav Theissen purchased a tract of land on the Cibolo Creek and together with John James surveyed the tract for a town which Theissen named Boerne after Ludwig Boerne, a German writer. The first settlers in this new town were Adam Vogt, Leopold Schulz, Wilhelm Friedrich and Fritz Louis. 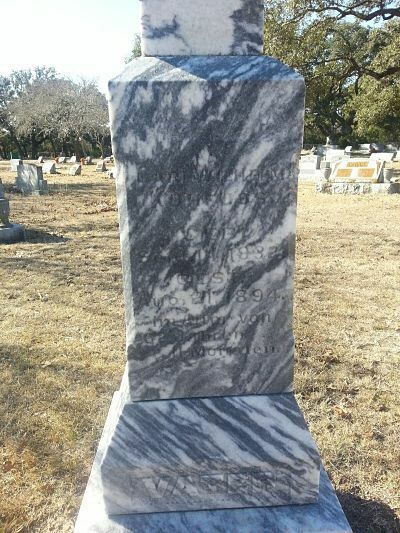 Vogt was actively involved in Boerne and later in helping organize Kendall County. 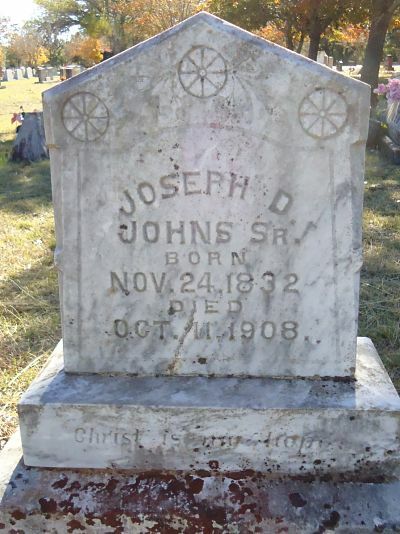 For a time he was a County Commissioner and later a county judge. Biesele, Rudolph Leopold. The History of the German Settlements in Texas 1831-1861. Austin, TX: Eakin Press, 1987. (Boerne, Kendall County, Texas). Adam Vogt marker; personally read 2013. 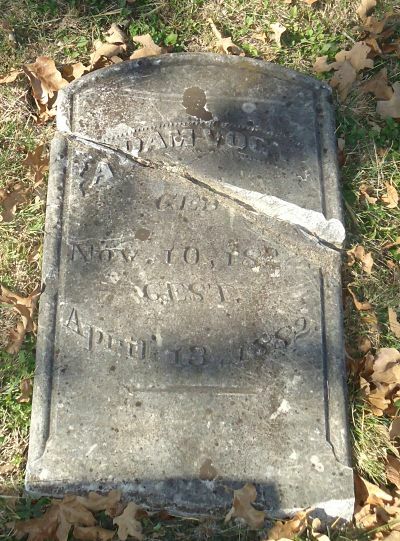 This marker is located next to George Wilkins Kendall grave. 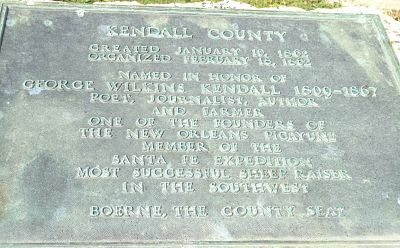 George Wilkins Kendall started raising French Merino sheep in 1850 along the Nueces River. By 1855 he had moved his herd to a 4000 acres ranch at Post Springs near Boerne. He continued to improve and increase his herd and “in 1858 sheared nine thousand pounds of wool.” The breed name was later changed to Rambouillet because they were developed on an estate near the village of Rambouillet, France. This estate was owned by King Louis XVI. My family raised this breed until 2008. At that time, we switched from Rambouillet wool sheep to Dorper hair sheep. Dorpers originated in South Africa. To read more about George Wilkins Kendall go to the Texas Handbook Online http://www.tshaonline.org/handbook/online/articles/fke19. Gard, Wayne, Rawhide Texas. Norman: University of Oklahoma Press, 1965. (Boerne, Kendall County, Texas). George Wilkins Kendall marker; personally read 2011.